Lord-Lieutenant Mrs Peaches Golding OBE is a highly experienced, award winning Executive and Non-Executive Director. She commenced the role of Lord-Lieutenant of the County and City of Bristol on 23 April 2017. Her commission runs until 13 December 2028, her 75th birthday. 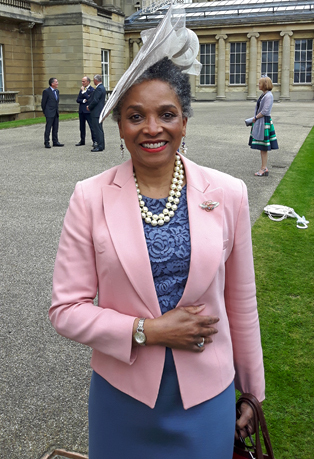 As Lord-Lieutenant, her interests include mental health, widening access to opportunities for those most disadvantaged in society, education, social justice, volunteering and poverty. In the commercial sphere she is interested in research and development, science and technology-based enterprises as well as sustainability and environmental protection. Peaches is the Independent Chair of the Bristol Water Customer Challenge Panel, Non-Executive Consultant of Moon Consulting Ltd and a Trustee of the ss Great Britain. She won the Bristol Post and Bath Chronicle ‘Outstanding Contribution to Business in Bristol and Bath 2015’ award and was England’s first black High Sheriff, serving the County and City of Bristol in 2010-2011. She led on regional and national campaigns regarding corporate responsibility for Business in the Community (one of The Prince’s Charities) from 1994 to 2011. Peaches was awarded the OBE in 2009 for services to minority ethnic people in the South West. In 2010 she was awarded an honorary MBA and, in 2017, was awarded an honorary Doctorate of the University by the University of the West of England. She graduated from the University of North Carolina, Chapel Hill, USA, with a Biology degree and was awarded an honorary Master of Business Administration (MBA) Degree from the University of the West of England. She is married to Bob and has an adult son, Charles.